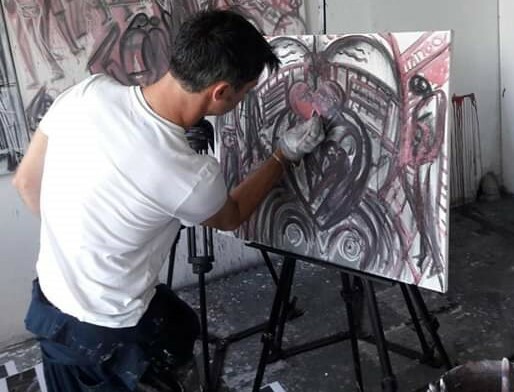 I was in Sweden when Monomedia Films asked me if I was interested in making a painting as a video for a track from the new Paul Weller album ‘True Meanings’. My bag was packed and I headed home to London, sketching ideas on the plane and thinking about what Mr Weller means to me as a person and as an artist. Paul Weller’s music has shaped my life, like it has for so many others. I first noticed the clothes and hairstyles in the NME and on the covers of the 99p Polydor singles from Our Price and WH Smith’s that my brother brought home to hastily play on our shared record player in our room. Once he was safely out of the room I took off our Mum and Dad’s Beatles albums momentarily to give The Jam another listen. I had to admit the sound was even more electrifying the second time around but I was half way through Philip Norman’s ‘Shout! the true story of the Beatles’ and my side of the bedroom was a shrine to the every phase of Beatledom. I was too immersed to see the connections. And then I played ‘Taxman’ and ‘Start’ back to back and my eyes were open to new true meanings. As I got older I revelled in the music of a man who changed direction and reinvented himself and his music constantly, always keeping true to himself and his art. Paul Weller is an artist who looks outwards, blurring the boundaries between music and art and working meticulously to create heartfelt songs that are much more than the soundtrack to your life. This is music that becomes a part of you from the earliest days of teenage discos when words from songs buried deep inside you fell from your lips as you sang along, right up to the heartbreaking wisdom of the new album ‘True Meanings’. I loved the song ‘Movin On’. I saw it as a song about the sustaining and nourishing power of creativity, a force that comes from our strongest emotions- grief and anger, but mostly love. Creativity and bearing witness to creative acts help to make sense of the chaos of life. 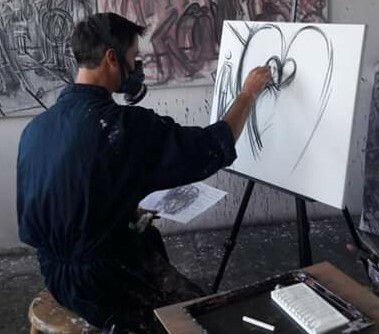 The indication was that the painting I was to create would feature a heart or hearts as a symbol. The creative inspiration was Peter Blake’s use of symbolism, colour and shape. I was nervous. I didn’t want simply to create a bad pastiche of the great Sir Peter, and I had one day to complete the painting while Lee Cogswell and Danny Thomson from Monomedia Films filmed and edited the video in my studio on the same day. I thought about my favourite Peter Blake painting- his Self Portrait from 1961. Much of my work is about identity and I have always loved this painting. 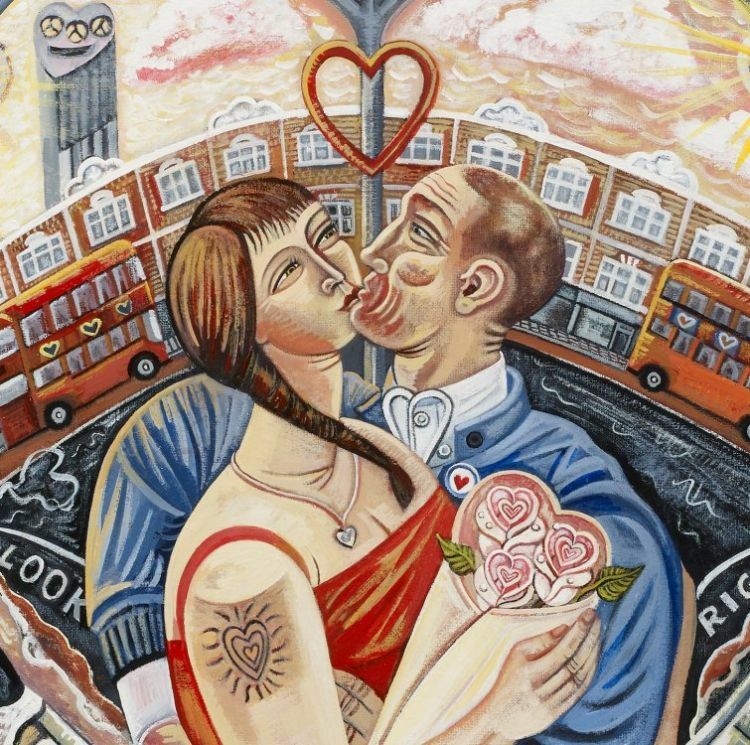 I used it for the inspiration for my Millwall painting.In his self portrait Peter Blake has decorated and pierced himself as if for a tribal ceremony, infusing himself with the power and spirit of his cultural icons. 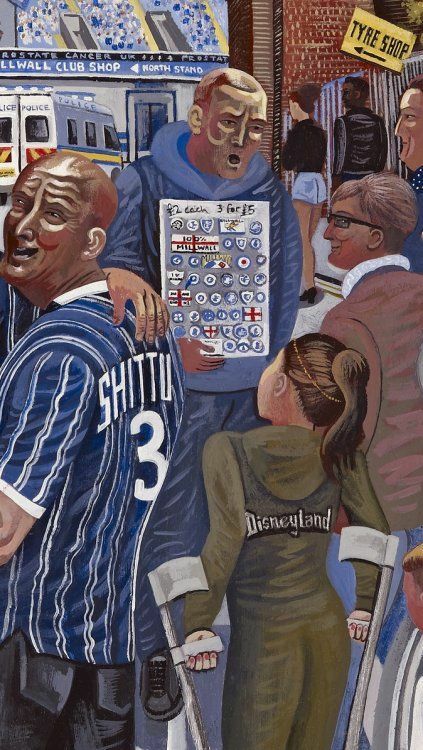 This painting led me to think of the Mod fascination with badges, labels and cultural identity. I thought of a young Mod and an old Mod, perhaps the same person, in the same picture plane, looking forward to the future or backwards to the past, both dimensions weaved together within the picture plane in a homage to multi layered Mod culture and philosophy. As a narrative painter I am a story teller and so I need stories to paint.There was no time for me to research and sketch in the streets which is the usual way for me to unearth narrative. The good people at Monomedia Films, producer Mark Baxter and director Lee Cogswell and assistant Danny Thomson had shot some footage of street scenes in Walworth in South East London, places and faces we all new well. I worked from their still photos to create a narrative based on a heart symbol and the sense of someone moving on through life’s stages, through relationships, grief and love. I focused on a line from Mr Weller’s song ‘That’s Entertainment’ …’two lovers missing the tranquility of solitude’. The kiss in my painting became the expression of that love. In his ‘Preface to Lyrical Ballads’ (1800) the poet William Wordsworth describes poetry as ‘the spontaneous overflow of powerful feelings: it takes its origin from emotion recollected in tranquility’. 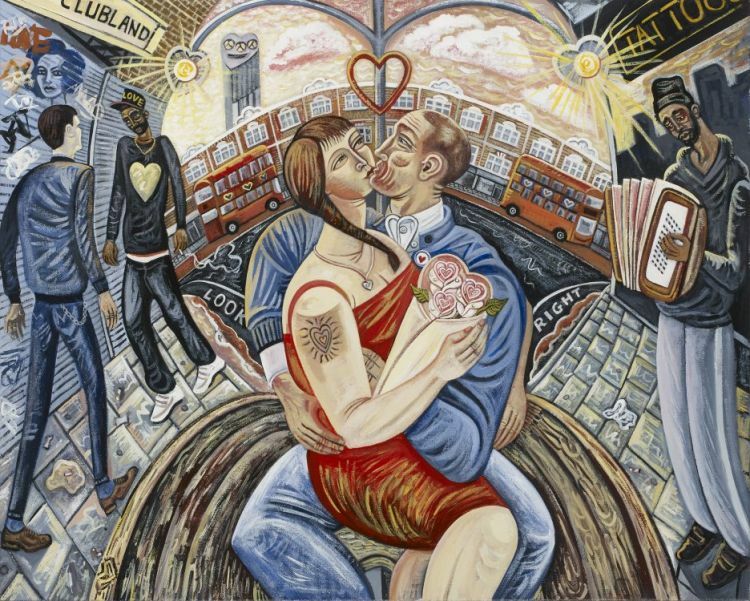 I wanted the couple in the painting, surrounded by the trappings of urban life, to embody Wordsworth’s sense of tranquility and strength and so I joined them into a heart shape. Their love is so powerful that it ripples and echoes in the streets they have wrapped themselves in. 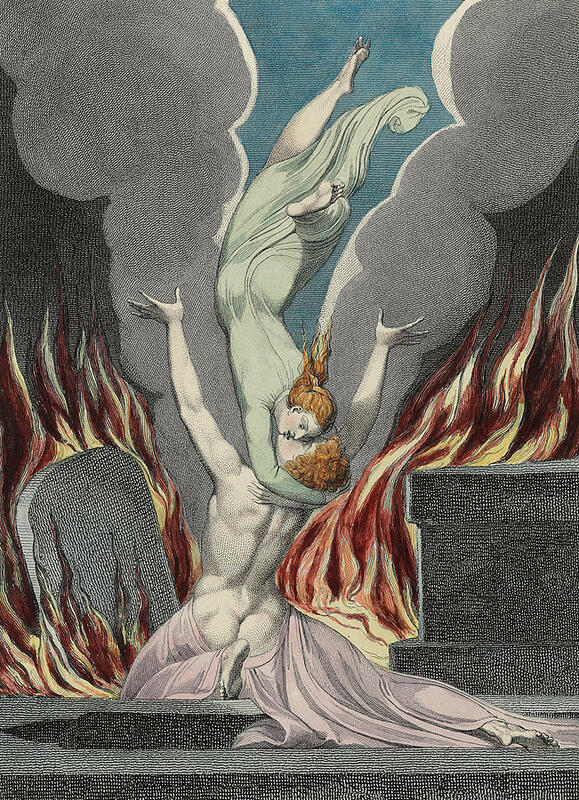 This romantic vision of emotional and creative regeneration led me to think of William Blake’ The Reunion of the Soul and the Body’ (1808). Blake’s mystic vision in my eyes is a powerful evocation of how love can repair the disconnection of body and soul that comes from the creative struggle, and equally from grief and loss. Moving on along life’s journey we are protected by love in our continual search for creativity and true meanings…..
We lost a friend at school to cancer many years ago. He was only 15 years old. I still remember the songs he liked and the excitement we shared at those early teenage house parties. I remember my confusion when he suddenly died and mostly I remember the time I didn’t visit him in hospital. My own Dad had died of cancer a few years before so maybe that was why I never went. After our friend died I found out that he had raised money for charity, long before his diagnosis. These days it’s a whole different world and cancer detection, care and treatment have all changed so much thanks to the dedication of NHS staff and cancer charities such as the Teenage Cancer Trust. 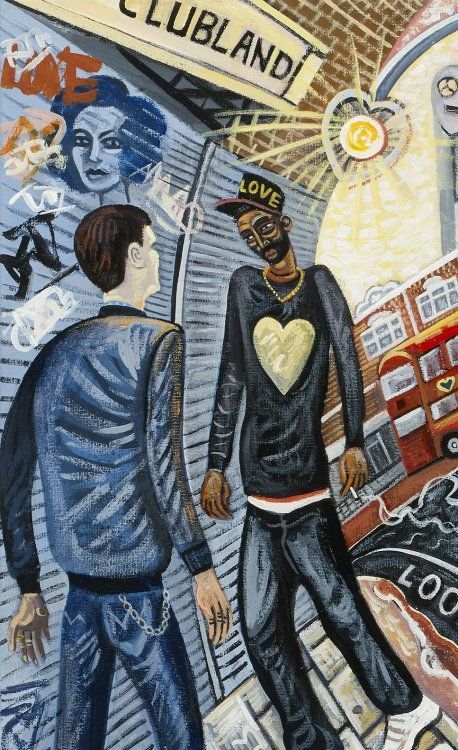 A limited edition print of the Movin On painting is for sale with 60% of the sale price going to the Teenage Cancer Trust https://www.teenagecancertrust.org/about-us/what-we-do. The Teenage Cancer Trust create world-class cancer services for young people in the UK, providing life-changing care and support so young people don’t have to face cancer alone.